MC Twisty, known worldwide for being the first MC in North America to experiment with Dubstep(circa 2002), has even earlier roots in the 2 step Garage and UK Grime genres. After being raised in a home where everything was played from Frank Sinatra, Bob Marley,and Paul Simon to Prince, Michael Jackson, Gloria Estefan, Stevie Wonder and Everything in between, his parents felt like it was time to learn what makes music really tick. He was training for Classical Piano at the age of 5 reaching high levels of State wide competitions by the age of 13. He was also involved with Concert and Marching Brass since he was 10 and through that experienced Band competition on a National Level. Growing up around Baltimore and D.C. in the 80’s, Twisty was exposed at an early age through older cousins and friends to the 2 sounds that are unique to those Cities Baltimore Club and Go-Go music(D.C.). This sparked and interest in Urban sounds that fell outside of the traditional Hip-Hop, R&B/Soul realm that most of his peers were pigeonholed into. This led him to Discover Jungle/ DnB in 1996 through Goldie’s album Timeless, from which he dove head first into the local scene, not looking to be an artist but just enjoying the music as a fan. The MC bug didn’t bite until 2 years later during his freshman year of college at VSU(Virginia State University). Many of his friends and acquaintances while there were prolific freestylers and seen as the best spitters on campus, that’s where he began to put his music theory training together, with what he was learning with his crew, and began to write his own rhymes. Disillusioned with what he saw some of his college friends go through with the opportunities in the Hip Hop community, as he returned home from College he already knew he had ways to parlay his new found hobby/skill into something bigger than the Hip Hop bubble. While working to crack into the DnB scene in his area, only home from school for 5 months he found the love of his life on 11/11/2000. 2 step Garage. As an MC trying out a new style of music it was impossible to perform as there were hardly any DJ’s in the Bmore/DC area that were spinning 2 step. So he fell back to perfect his craft, since MCing to Garage takes a slightly different skill set relearning rhythms and patterns as to come off as authentic as possible. In the meantime attending every show that UK 2 step artist were performing at in the area and building relationships, he runs into local Baltimore Club DJ Joe Nice, that is on a similar trajectory, and is turning into a 2 step DJ. In 2001 with DJs Brother Pinch, Light Touch, Ricky Ricardo, Joe Nice and MC Twisty formed the 2 charming crew. They hosted a weekly Garage party @ Sonar in Baltimore run by Ultraworld and Starscape head honcho Lonnie Fisher. In 2003 Twisty was apart of the launch of Gourmetbeats radio started by Joe Nice who had moved on to Dubstep by then. 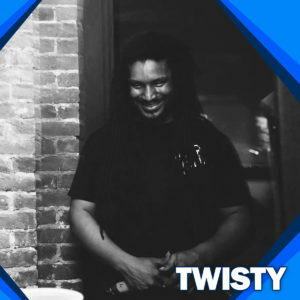 Since then Twisty has performed with any and all Heavyweights that make it to the region and carry the flag of 2 step Garage, UK Grime, Dubstep and DnB/Jungle. Including but not limited to MJ Cole, J da Flex, Emma Feline, Oris Jay, Mrk 1, Plastician, Benny Ill, MC Blakey, D Double E, Spooky, Sk¡tz Beatz, Dev 79, Kahn and Neek, Demon, Mala, Coki, Hatcha, Author, Truth, Swindle, Silkie, Seven, Preditah. UKG Social Boss. Deep Sessions Host. Reconstrvct yr 1.5-2.5 host.